Honda has commenced deliveries of the CB300R in India. Honda had launched the neo-retro styled motorcycle in India in February, this year, at Rs 2.41 lakh and had thrown open bookings across its Wing World dealerships. 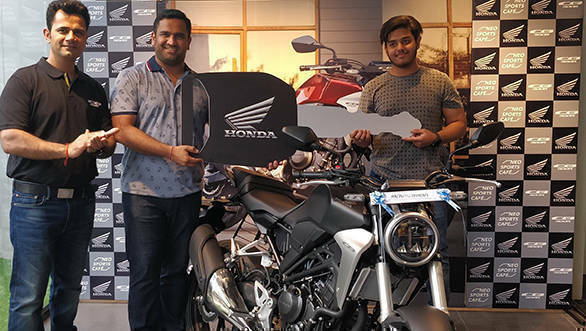 Customers in Chandigarh, Jaipur, Delhi and Haryana took delivery of the Honda CB300R, and the rest of the dealers in India will begin deliveries shortly. The two-wheeler company had already confirmed that the CB300R is being brought to the country through the CKD route. Along with the motorcycle, the company offered a list of 16 accessories and four customised kits - Premium, Protection, Standard and Sports. The 2019 Honda CB300R carries the new 'Neo sports cafe line' design which, in essence, is a mashup of modern and retro design. Up front, the bike sports a circular headlamp with an exposed instrument cluster. A beefy tank and minimal body panels expose a bit of the new steel diamond frame, evident from the side profile. The CB300R is powered by a 286cc, liquid-cooled, single-cylinder engine with a four-valve, DOHC head that produces 30.45PS and 27.4Nm. Given the 147kg kerb weight, the CB300R has a 207.14PS power to weight ratio that should translate to a quick motorcycle. The suspension components look beefy with 41mm upside-down forks and a preload adjustable monoshock at the rear. braking duties are carried out by a 296mm, petal disc along with a radially-mounted, four-piston, Nissin calliper. The CB300R comes equipped with an IMU as well, which works full-time in sync with the ABS. 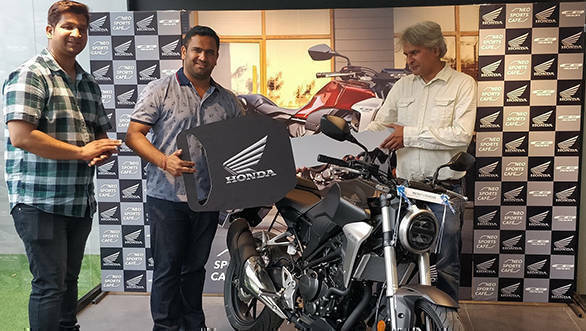 Speaking on the commencement of deliveries, Yadvinder Singh Guleria, Senior Vice President - Sales and Marketing, Honda Motorcycle and Scooter India Private Limited, said, "Indian middleweight biking enthusiasts welcomed the Neo Sports Café inspired Honda CB300R with a lot of enthusiasm. Overwhelmed by the response since its launch in February, we have revised our production plan to meet the additional demand."